Just one hour south from Lima city there is an archaeological complex that, even until now conserves the mysticism and religiosity of their past. This is the Pachacamac sanctuary one of the largest religious centers on the Peruvian coast. It contains various pyramids, temples and large plazas, where visitors can enjoy a pleasant walking while exploring the site. According to archaeologists Pachacamac was the most important pilgrimage centre in ancient Peru, and at its glorious days the place received hundreds of people from all over Peru. The sanctuary also offers magnificent views of the Pacific Ocean as well as of the Lurin Valley. 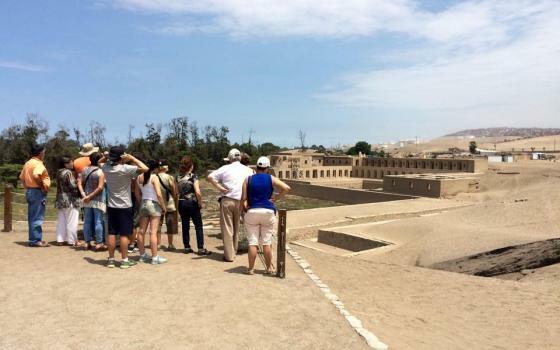 In addition, the tour includes a visit to the Museum located inside the archaeological complex, which displays the idol of the God Pachacamac and ancient remains found at the zone. Total cost for the tour: 45.00 USD per person. - A minimum of two participants are required for this tour. - We recommend to wear comfortable shoes, sunglasses, sunscreen and a hat, take enough water and spare battery for your camera. THIS IS A PROMOTIONAL RATE, PLEASE ASK FOR RATES IF YOU TAKE THE TOURS FROM THE AIRPORT OR THE CRUISE SHIP TERMINAL.